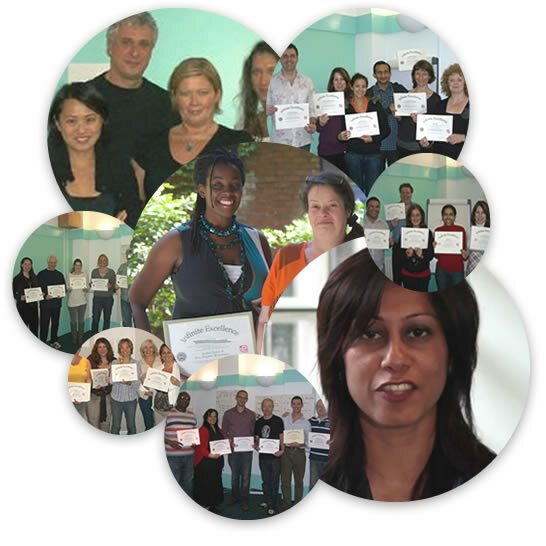 INFINITE EXCELLENCE are the UK’s paramount NLP Training & Coaching Company. We train in and work with established and proven techniques in Neuro Linguistic Programming, Time Line Therapy™, Hypnosis and NLP Coaching, to help you unlock and achieve the highest level of excellence that is already within you or your business. We have over 20 years of experience of using our techniques to help you achieve your goals, understand and overcome fears or discover what beliefs are stopping you from getting what you want and deserve in life. As a result of Colette's work with me I feel much change and transformation has occurred within myself and I am now creating a wonderful future. Colette's manner is warm, patient and friendly, as I felt totally comfortable during the whole process. I thoroughly recommend Colette for any kind of personal change or personal breakthrough work. The course exceeded my expectations on every level and I will put these to use in making my dreams a reality. Colette, thank you for a life changing experience. I loved this course so much it was awesome from start to end. Excellent trainer, great blend of fun and learning, responds to needs of group and individual. I like the personal style with Colette and it is good to have someone so open minded. Exceeded my expectations in all ways. One of the best investments I have made for myself. I decided to enroll for the NLP accelerated Practitioners course provided by Infinite Excellence after much research of other such types of training. From the first conversation I had prior attending the course, I felt that I'd made the right decision. That feeling was fully justified after completing the 7 days course taught by Colette White. Colette was a phenomenal instructor, she connected well with all her students, her teaching style was engaging and very informative. Thanks Colette for all your support and sharing. Colette creates a comfortable and reassuring environment to work in. This helped me to confront my phobia. It enabled me to disregard any negative associations whilst still holding on to the positive lessons learnt. It is important for me not to feel I have to constantly look over my shoulder and that is what Colette helped me to regain. Thank you Colette for your feedback, your approach and general style was spot on. I knew what I needed to do to improve and at the same time feeling motivated to do it. Colette has a fantastic easy style, very approachable and always clear in outcome. Trainer was simply excellent, just filled me with more and more confidence as course went on and made me feel I could let go of my anxieties. Feel I can grab my future with no fear now. An intensive 7 day course made enjoyable by a fantastic bubbly lady and some new friends! As a doctor, this course has been one of the most valuable course I've yet completed. Thank you! This course will benefit so many people. A fantastic course – time and money very well spent. A life changing experience... it was excellent. Felt like I got what I wanted and more. Had fun! Learned heaps! Possibly changed my whole life!! I advise anybody... anybody to take this course whether you feel fully together or not! I feel like I have a kit bag of tools to pull on for the future. It met over and above my expectations." "Very good, enjoyable, thought provoking, professional and well executed." You (Colette) have a lovely relaxed style, fun but professional and authoritative when you need to be. A great course, Colette delivered it really well. A packed week of learning with every day building you towards becoming an expert practitioner of NLP. Colette knew exactly what she was on about and presented it in a very confident and fun manner. Fantastic balance between theory and practice with lots of time to ask questions and practice techniques. Felt fun and I was motivated throughout. Great pace - always something to learn, but with sufficient time to do so. Huge thanks enjoyed it tremendously. It has been fantastic. You (Colette) have created a great course and developed great rapport with the group." The course was excellent. Definitely recommend it to others. Thank you for the best week of my life. Thoroughly enjoyed – can't wait for Master Prac." Trainer is really friendly, approachable and adapting to the class. Very engaging, (Colette) knew material well. Well paced throughout the week, just enough time allocated to each subject area. Trust yourself, choose Infinite Excellence for the best training you can get. Colette is awesome and will take you to a new place.